Catherine Karnow, Photographer traveling with the DOVE Fund, January 2013. "Yesterday this woman went from someone who could only move along the ground like a crab to feeling like a queen as she was given mobility for the first time in her life. After this photo was taken she sailed away down the road waving at us and blowing us kisses. In 2014 The D.O.V.E. 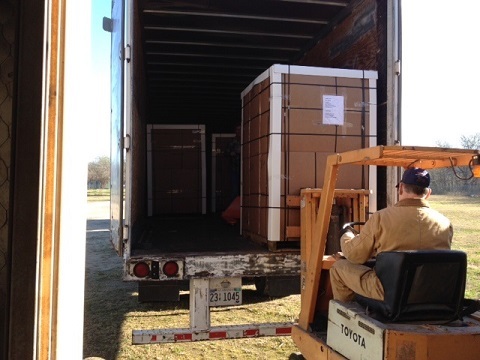 Fund returned to Vietnam, and provided an additional 175 carts, in partnership with P.E.T. International, The International Red Cross and Hearts for Hue. All of these organizations made the additional carts possible. The D.O.V.E. Fund is currently working with P.E.T. International for another shipment of carts to Vietnam later this year. The Gift of Mobility Continues in Vietnam. On February 18th, 2015, more P.E.T. Cart's (102) were shipped from the Personal Energy Transportation factory in Brazos Valley Texas. These carts are scheduled to arrive at the Naval Station, in San Diego California on Friday February 20th, 2015 to be placed with onboard the USNS Mercy for transportation to Vietnam. This project is part of “Project Handclasp” organized by the D.O.V.E. Fund and Hearts for Hue in Vietnam. The Brazos Valley P.E.T. shop appreciates all the support they receive that allows them to participate in projects such as this.